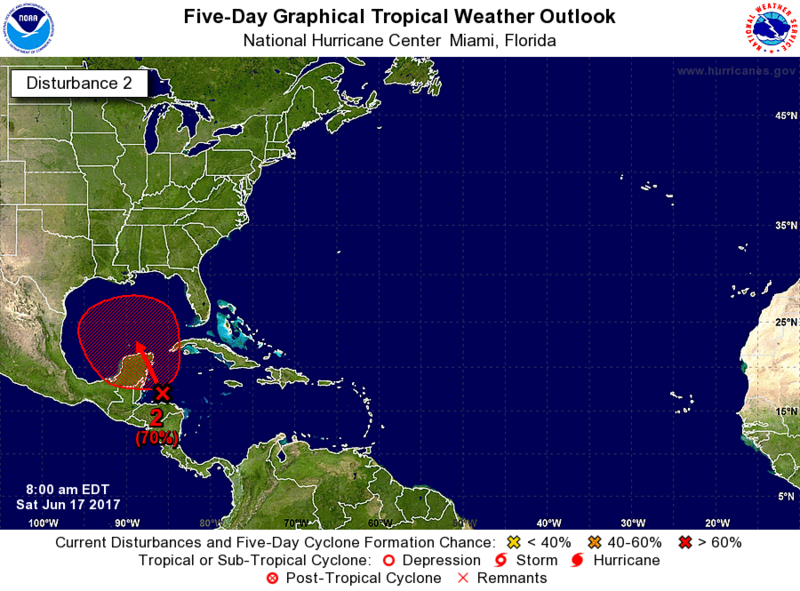 Harris County, Texas – June 17th, 2017: A tropical depression or tropical storm is likely to form in the southern Gulf of Mexico early next week. At this time we do not have a good track on where it will make landfall as the “track window” extends from the Texas coast to Florida. At this time, it does not appear to develop into a high-impact hurricane. The primary threat for us will be heavy rainfall IF it makes landfall to the Texas coast. We will be monitoring this system closely and will bring you additional updates as they become available. National Weather Service Memo: A broad trough of low pressure is producing a large area of cloudiness and showers over the northwestern Caribbean Sea and the adjacent land areas. Conditions appear to be favorable for gradual development of this large disturbance while it moves slowly northwestward across the Yucatan Peninsula this weekend, and a tropical cyclone could form early next week over the southern or central Gulf of Mexico. Regardless of development, heavy rains are likely to spread over portions of Central America, the Yucatan Peninsula, Jamaica, the Cayman Islands, and western Cuba during the next several days. * Formation chance through 48 hours…low…20 percent. * Formation chance through 5 days…high…70 percent.